Les remorques fermées à North Richland Hills, TX sont légères, aérodynamiques et conçues pour offrir une plus faible consommation de carburant, facilitant le remorquage. Chaque année, des millions de familles utilisent nos remorques carrossées pour déménager. U-Haul offre une vaste sélection de remorques carrossées à louer dans la même ville ou pour un aller simple. Consultez les tailles de nos remorques fermées et réservez en ligne une location de remorque chez U-Haul Moving & Storage of N Richland Hills! Les remorques ouvertes sont idéales pour le remorquage de charges grosses ou surdimensionnées à North Richland Hills TX 76180. De nombreuses remorques ouvertes sont louées avec une rampe de chargement pour plus de commodité. 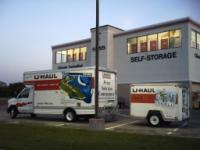 La sélection de remorques ouvertes offertes chez U-Haul Moving & Storage of N Richland Hills représente une solution abordable pour des projets d’amélioration résidentielle, la livraison de meubles ou le remorquage de véhicules récréatifs. La location de remorque ouverte est également populaire auprès des entreprises pour la livraison et lors de salons commerciaux. Les remorques ouvertes sont offertes en une variété de dimensions et de styles afin que toutes les voitures puissent les remorquer. So everything was good overall. I rented a 26' for 24 hrs. Called the next day early to see if I could keep it for another day. The woman on the phone stated in her own way that I needed to have it back because there was another reservation for it. There was a bit of bad communication on how that was given though, which I didn't take well and I let that be known to the location. They billed me for that truck, I rented out a 15' for another 24 hrs then brought it back. All in all for a total of 80 miles for the two days, short distance move, I spent about $170. The only thing I'd mention besides the miscommunication between myself and the woman on the phone was because they edited my contract from the first truck, and I paid for that one on the first day, they charged me for that mileage again on the second day. Which I wouldn't have noticed had my wife not looked over it. So I ended up paying for the 26' truck mileage twice. Not the end of the world, but that would have been the cost of the gas I replaced for the two trucks for the two days. Rental trailer was 36yrs old per the maintenance contractor that came out to fix the flat and try to fix the left side brake & turn signal light. He had to take it to his shop to rewire. Fortunately I had unloaded the trailer by this time so it was not much of an inconvenience to me. Unfortunately for U-Haul the trailer is 100 miles from rental location so they will have to get it back to their business. I would recommend updating your equipment. Morning staff were very nice and pleasant. Afternoon staff when I dropped off were not so outgoing so to speak. But it was still very quick and easy to get in and out. Not only was it impossible to reach anyone because the location had all their calls forwarded. The staff messed up the entire checkout process and in turn overcharged my team. They accidentally redeemed the gift certificate I'd purchased, specifically for this transaction, without applying it to the balance and then required my team to pay on a personal credit card because the gift certificate was coming up redeemed. Then I had to deal with unravelling the mess with customer service which was difficult since no one could seem to understand what had happened and how my team had been charged. Overall this was a horrible experience. I have little confidence in Uhaul and this location. We will absolutely not use this location ever again. Charity (phone support) is the only person that was actually helpful during the process. I had a vehicle breakdown and I was told by dispatch that I would be provided another vehicle the next morning and when I got to uhual location the next morning they didn’t get any notification about me coming to pick up a vehicle. Then they ran out of cargo vans while I was waiting in line. So then they sent me to a different location and gave me their word that the next location would have my vehicle ready and waiting when I arrived since I had waited soo long, only for me to get to next location and vehicle was not ready and manager had a attitude with me and after waiting almost another hour and her using my phone until it was almost dead she shoved the keys into my hands. Employee was a little grumpy at return. I've never had any problems at this location. Send them to train the people in Euless, TX and give them a bonus for it. Well I am very disappointed I have yet to see the final bill, even before I got your review request. My driver was informed that they would email me on the return of the truck and I have yet to see that either. Hopefully this will not be a ordeal for much longer. My $29.95 truck rental cost me $80 and was useless for my chore. I asked for advice BEFORE renting and was told that this particular truck and ramp would work. It didn't. The brakes and transmission sounded and felt like they are in desperate need of work. Overall a waste of time and money. The app wouldnt let us login in so we had to use the order number to return the trailer after hours. It worked though and we were able to return the trailer after trying to figure out how. Great trailer though and it pulled really well! The customer service was also excellent and they made us feels like our business was greatly appreciated! We will be using Uhaul again in the future! Excellent service and staff knowledge and helpful. I ordered an appliance dolly and they forgot to put it in the truck. I was picking up on a Friday evening so I am sure they were in a hurry. It turned out okay but I would have given 5 stars had they not forgotten. Love renting from the guys at Hwy 26 and Harwood. Great service and a can do attitude. The trailer dolly was damaged which caused some of the driving to be difficult. You have gotten good scores on your services!